One of the best things about having this candy blog is that people in my life are sweet enough to bring me candy when they travel! 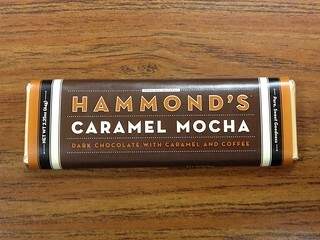 This Hammond's Caramel Mocha bar came from my boss after her trip to Denver. It had a friend, called Pigs n' Taters (bacon and potato chips) but my husband finished that one before I could blog it. For the record, it was good. Hammond's is a Denver company that has been around for quite a while. There are some other fun-sounding flavors on the Hammond's website: Whoopie Pie, Cookie Dough, Malted Milkshake - I was impressed! As flavors go, Caramel Mocha isn't too out there, but I appreciate a well-executed classic as much as funky innovation. 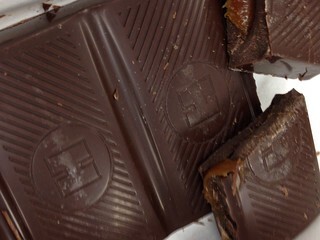 The chocolate had a rich, glossy look to it, and it smelled like coffee and very dark chocolate. Surprisingly, the coffee flavor wasn't that strong - good news for me. The chocolate had a big, crisp snap, but it didn't break along the perforations at all. This is a pet peeve of mine, especially in a caramel bar, because it makes a big sticky mess. The caramel was extremely sticky and creamy (not at all runny). The caramel also didn't have much of a burnt sugar flavor, maybe because it seemed to carry the mocha aspect of this bar. The flavor conveyed the richness of a mocha, but the actual coffee flavor reminded me more of coffee grounds than liquid. Still, it went well with the bitter flavor of the cocoa. The bar was good, but not my favorite, and it was sticky as all get out. Who doesn't love the Minions from Despicable Me? 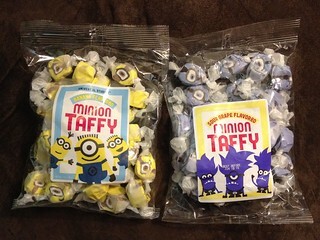 I'm a huge fan, so when I was browsing around a candy store at Universal Studios Florida, I couldn't resist these bags of adorable Minion Taffy. The Banana flavor came highly recommended by the cashier, but Sour Grape is more my style, so both bags came home with me. A bag of Minion Taffy ran about $8 or $9, but that's an amusement park for you. Besides, I'm willing to pay a premium for cute. 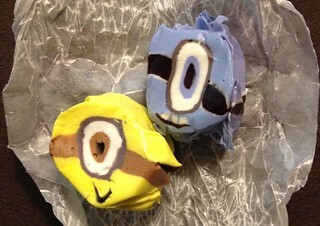 Look at their goggles, and check out the little teeth on the Purple Minion! I loved how the variations in the taffy meant that each Minion was a little different, just like in the movies. I was ready to give these an A+ without even tasting them!